At last, we have finally released best designed menus using modern technologies, HTML5, CSS3, Canvas. Got rid of all drawbacks of flash menus, we made earlier. New menus compatible with all modern browsers, including mobile browsers. Also compatible with old browsers in simplified mode. 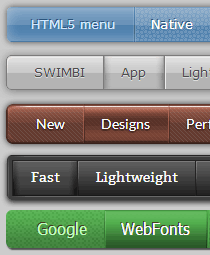 Our new desktop application (Win and Mac) called SWIMBI, will make a website menu in minutes. If you are fan of WordPress, don't worry, we are working with The Blog Starter to make a plugin to connect the app with WordPress blogs and websites. However you can very well do without WordPress using SWIMBI. It has built-in code editor and of course everything you need to make a perfect menu. SWIMBI menu builder comes with 12 base designs and 6-7 ready-to-use configurations for each base menu design, in total more than 70 menu designs. Intuitive interface, but with detailed help at hand. Live, interactive preview. It's only the main options, available in current version. More will be added in near future. Copyright © 2004-2019 f-source.com. All Rights Reserved.